I had rented a 2016 Mazda CX-5 since 08/2015, after driving a 2012 Audi A5 for 4 years. 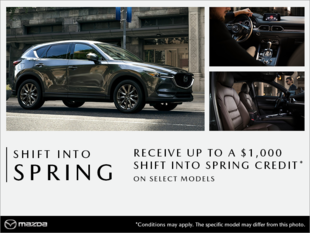 I assure you that I enjoyed the driving of my CX-5 as much as my Audi for $ 300 less per month ..... Last spring, I participated in an event organized by Mazda in Mirabel, where I had the chance to see and try the new red 2017 CX-5, I found this car so beautiful, but considering my 4 year lease it was too early to be able to change my vehicle. During a visit for a service at Spinelli, I was able to exchange as is often possible with Mr. Mariano who is director. He gave me a price for leasing the red Mazda CX-5 2018 that I had loved in Mirabel. I still can not believe it, I took possession of it on March 27th. It only costs me a few extra dollars a month, but my insurance costs me less and there is no annual fee for the starter, which is only $ 75 for my previous one. It is our turn that they remained 17 months in my previous contract. Finally, given the difference in interest rates, the monthly payments were the same on my new vehicle for a lease of 36 months as 48 months, so I now have a lease of 36 months only. I have not hesitated to commit myself again with Spinelli, I can testify to the quality of the maintenance service and their professionalism with Amélie and now Emmanuel.